On our way back from NYC on Sunday, I remembered about a spot that my father used to take me to eat Tacos. The New Haven CT, Taco Trucks. A line of at least 10 Taco trucks, 1 hot dog stand, a churro lady that sells churros 2 for a dollar and I remember a Jamaican truck when I was a kid, but unfortunately that was not there. No one believed me until we came around the corner and there it was, a row of Taco trucks, hundreds of the local Mexican population enjoying a beautiful Sunday afternoon by the water as they do every weekend. A way of life, a community coming together to enjoy their heritage as they would back in Mexico. Ill tell you that the memory of my dad buying me a half dozen tacos and a churro as we were driving from Boston to Miami (which we did many times as I was growing up) was so strong that for a second I felt like he was right there with us. As a kid I was all about beef and chicken, now a days tongue and cheek is more my style. Just as I did when I was a kid,for nostalgia I ordered half a dozen beef tacos( my wife was a little upset that I didnt ask for no onions) , a couple of tongue tacos, a bag of churros from the churro lady......I was so excited that a drink was forgotten. But honestly I didn't care. These are the kinds of food memories that fortunately do not change. 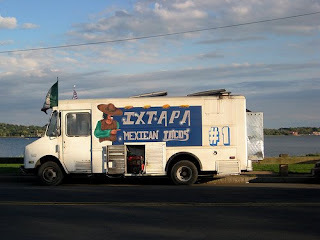 After years of not going to the Taco Trucks, aside from a few new shiny trucks, I can tell you that the Tacos are the same great tacos I remember. The eating such simple food, yet feeling like this is the food that has set the stage for all the "high end" mexican cuuisine in this country. It is a feeling that will never subside. That's an awesome story. Thanks for sharing.